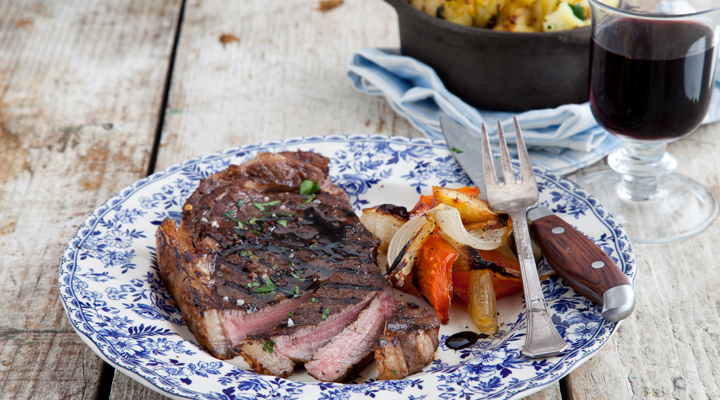 This steak only requires a fast and easy marinade and is full of flavour. Try cooking the steak on the BBQ! Place the carrots, butternut squash, parsnip and onion on a large baking tray. Drizzle with the honey and olive oil and season lightly with salt and pepper. Roast in the oven for 30 to 35 minutes, until the vegetables have softened and slightly caramelised. Stir during the cooking process to ensure all the vegetables are cooked through. When the vegetables come out of the oven, sprinkle with the chopped parsley. Meanwhile, combine 75ml of the balsamic vinegar and the crushed garlic in a non-reactive bowl. Add the steaks and place in the fridge for 30 minutes to marinate. Place the potatoes into a saucepan of lightly salted boiling water. Add the two whole garlic cloves and cook for 18 to 20 minutes, until the potatoes are cooked through. Drain, picking out the garlic cloves. Crush the potatoes with a potato masher and set aside. In a separate small bowl, gently mash the garlic with a fork. Melt the butter in a small pan and add the mashed garlic and herbs. Season with some salt and pepper. Transfer the crushed potatoes to an ovenproof dish and pour the garlic and herb butter over them. Pop into the oven for 10 to 15 minutes, until slightly crisp on top. In the meantime, heat a griddle pan until it’s smoking hot. Remove the steaks from the marinade and brush them with a little rapeseed oil. Add them to hot pan and cook for 2 to 3 minutes on each side for medium, although the cooking time will depend on how thick they are. Remove from the pan and set aside to rest for 5 minutes. To serve, place a steak on each plate with some crushed potatoes and roasted root vegetables. Drizzle the remaining 25ml of balsamic vinegar over the steaks.